Aickman - 8th Fontana Ghost Stories | Vault Of Evil: Brit Horror Pulp Plus! A. E. Ellis - The Haunted Haven: Ticlas Haven, a fishing village off St. Brides Bay. Three surly brothers drown their parsimonious uncle during a storm at sea, thinking at last they'll get their hands on his fortune. It isn't to be. Within three months of the old man's murder, each of them has met with a fatal accident. Thereafter, whenever a gale hits the South Haven, the foursome terrorise the villagers by setting out to sea in their wrecked fishing smack after dark. The doctor and the innkeeper attempt to put a stop to their ghostly capers. The zombie-like spectres resent the interference. 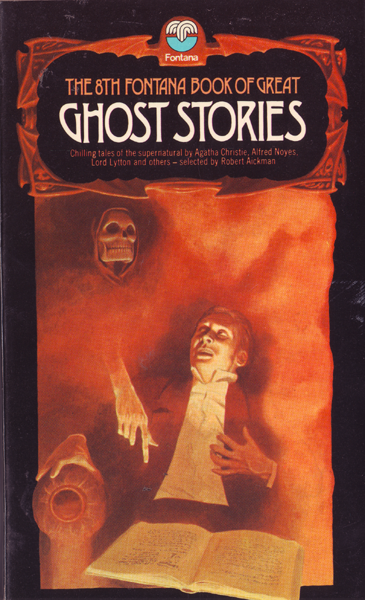 It's such a shame Arthur Erskine Ellis (1902–1983) doesn't seem to have left behind enough ghost stories to warrant a collection to himself. An eminent conchologist and molluscan, apparently Ellis wrote his handful of genre stories several years before they saw publication, thereafter devoting his literary talent to writing about snails. The Life-Buoy - Hugh Lamb (ed.) - The Thrill Of Horror, W. H. Allen, 1975. Compartment 1313A - Hugh Lamb (ed.) - The Second Star Book of Horror, 1976. Gertrude Bacon – The Gorgon’s Head: Greek islands. Captain Brander relates the story of how The Hasler ran aground on Zante and he and Travers sneaked ashore to explore the cavern shunned by the local peasants on account of its being haunted. Like so many before him Travers is transformed into a column of black stone. Brander catches sight of Medusa’s awful reflection in a pool of water and runs screaming from the cave. deliciously creepy if more minor horror gem than trad ghost story. Agatha Christie – The Last Seance: Simone, the most gifted medium in Paris, is all seanced out. With each sitting she grows paler and thinner. Husband-to-be Raoul has reluctantly agreed that after today she can give it all up, but she has one last engagement with bereaved mother Madame Exe. Simone is uneasy; she dislikes, even fears Madame Exe although she’s had great success contacting her dead daughter Amelie. At the previous sitting, the ectoplasm materialised into a solid image of the child: Raoul could even touch it, but withdrew his hand when he saw how much pain it caused Simone. Now, for the last seance, Madame Exe insists that Raoul be tied to his chair to prevent any trickery …. H. R. Wakefield – The Red Lodge: The narrator, his wife Mary and son Tim move into the old Queen Anne house of the title, rented from an unscrupulous estate agent, Wilkes, who turns a blind eye to the numerous tragic deaths associated with the property. Before long the new residents are subjected to all manner of supernatural manifestations, beginning with the slime trodden into the carpets of many of the rooms by persons unseen and the recurrent apparition of a ‘green monkey’ sprinting toward the pond. Legend has it that, back in the early eighteenth century, the then owner bribed his servants to terrify his wife to death. They succeeded all too well, and one night she ran from the house and drowned herself. Her husband wasted no time in installing a harem at the lodge, but one by one his lovers followed her example. And so it has continued to the present day. Apparently the first ghost story Wakefield ever wrote, this has endured as a genuine creepy classic. Sequel Ghost Hunt is worth reading too. Midnight Express is one of my all time favourites. Its an utterly bizarre story but fascinating. And all within just five pages. hi, marillionboy, thanks for joining us - glad to have another anthology man aboard! yes, Midnight Express is very effective. i can identify with the main character because when i was a kid, i taped two pages of a book together because an illustration, depicting a train with an angry facial expression, gave me a full-on, woke-up-drenched-in-sweat nightmare. would you believe it was one of the Thomas The Tank Engine books? Another train trip to London and another Fontana GGS to help pass the time. This one was more interesting because it's the only one I read as a little 'un (well, I was 12!). The Haunted Haven - A. E. Ellis. Nice little Cornish opener. The vengeful zombies on their way to get the doctor raised a few chills when I first read it and the story had held up well over the years. Oh, and hurrah for Vault, as I only have to look up a couple of posts and there is his contribution to Frighteners - I had completely forgotten he had written that, and it's a decent little tale as well. The Red Lodge - H. R. Wakefield. This one scared me silly back in the day and I have to say it was an absolute pleasure to rediscover it. A properly scary haunted house story. What the hell is going on? What's that green monkey thing? Is that woman being scared to death and drowning herself why the place is haunted or not? Classic stuff and it makes me very unhappy indeed that I have virtually nothing else by Wakefield EXCEPT 'They Return at Evening' which I understand was his first collection. In her introduction Barbara Roden writes 'he may not have been the kind of person one would have wanted to spend much time with at a party' but having read the first tale in that book last night I think he might well have been a blast of the Birkin variety. "I have few vices, although I suppose pushing my wife down a flight of stairs must be considered one of them" and some very non-PC comments about Latin American countries suggest the table talk would be nothing if not lively. Some more thoughts on Wakefield as I get through that book, I think. The Gorgon's Head - Gertrude Bacon. Much more straightforward seafaring tale of young Captain's encounter with said petrifying item. The Tree - Joyce Marsh. Possibly the inspiration for the rubbish Joan Collins episode of Tales that Witness Madness, or possibly not. Woman's husband exchanges health with a tree but then he begins to develop a fondness for standing in the garden. best days work they ever did, he says, hiding behind the sofa. as seems too frequently the case of late, i'm playing catch-up again, but am very glad to see you've got right stuck in on this one, Lord P., as i reckon it's one of Aickman's strongest selections. my understanding of it is that Fontana wanted him to use more contemporary authors (having dug himself a hole by insisting there were only a handful of decent ghost stories in literature, he didn't have much option). A. E. Ellis was a real find and Joyce Marsh knocked out some terrific creepy horrors for Mary Danby, so he left them on a good note. i'd be interesting to know if sales went up or down during the satanic reign of RCH ? Presumably they must have done ok as RCH ended up editing the next 12 in the series! Has anyone noted yet that a collection of A.E. Ellis's tales, comprising all those which were published in various anthologies in the 1970s, has recently been published by Phantasm Press? The Haunted Haven and Other Ghost Stories is edited by Richard Dalby and is a small book (97pp) at a small price (£7.50). A number of Ellis's tales are in the M.R. James tradition, and I'd say this is an essential for any Jamesian library (though I haven't actually seen a copy myself yet, so I can't say whether any tales not on the list above are included). The book isn't listed on the Phantasm Press site so far, but it is out, and can be bought from Phantasm via Amazon. I would definitely like to see a TOC for this title as I am curious if if it contains any previously unpublished material. Phantasm has released a couple of nice titles and I wish they were more readily available here in the States. I would think probably not - given that the book is only 97 pages long, and there are six previously-published stories, I shouldn't think there would be room for any aside from these. You are probably correct. Still, having all six stories gathered together with (hopefully) one of Dalby's always excellent introductions is something to b3 excited about. So I tried contacting them through Amazon with the question to change their settingson Amazon. No reply. Tried their contact form on their webpage. No reply. So I tried the E-mail adress on their site...... No reply. Apparently the don't want to sell the book? It's not that I need it as I just recently collected the books that included the stories from several Amazon dealers. Some of them are not in the best of state but The 10th Fontana Book of Ghost Stories held a very nice surprise.